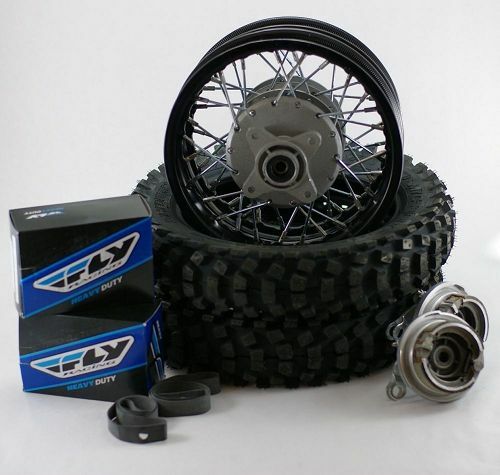 Complete 10" Wheel Package for Honda CRF50 XR50 dirt bikes. Includes 10" x 1.85 Black Wheels, Shinko SR520 10 x 2.75 Tires, Rim bands, Fly Racing heavy duty tubes, and new brake drums with brake shoes. If purchased individualy, this kit retails for over $286. value. 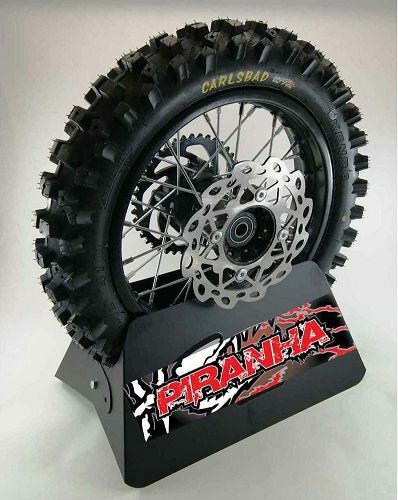 Piranha Pit Bike Motard Wheel Kit. 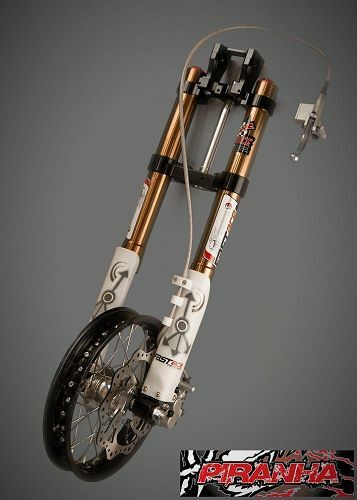 Includes 12 x 2.50 Front and 12 X 3.0 rear aluminum wheels, Piranha G Style 190mm and 220mm discs, and 37 tooth rear sprocket. Available in Black or Black with Silver polished lip. 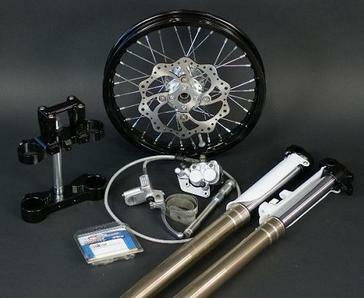 Complete front end kit for the Kawasaki KLX110. Just In! Front end kit includes 700mm Zhengling forks (same make as GPX/Pitster Pro) with compression and rebound adjustment, Redesigned Piranha KLX110 billet fork clamps with forward and backward adjustability, Steel 14" front wheel with aluminum hub, double piston front brake system. This system is completely designed for the KLX110. 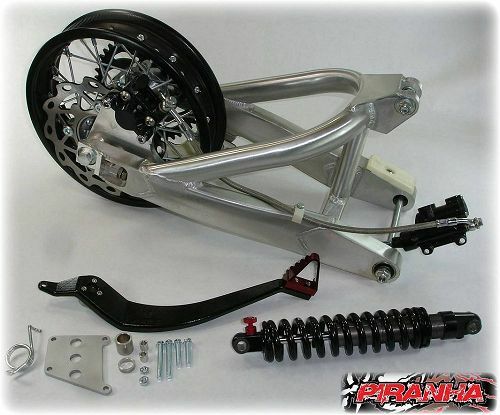 Simply pull of your old front end, and bolt on your new inverted fully adjustable Front end kit! All mounting hardware included. Includes All Balls KLX110 steering stem bearings! New for 2010. Piranha's complete +5 rear end kit. 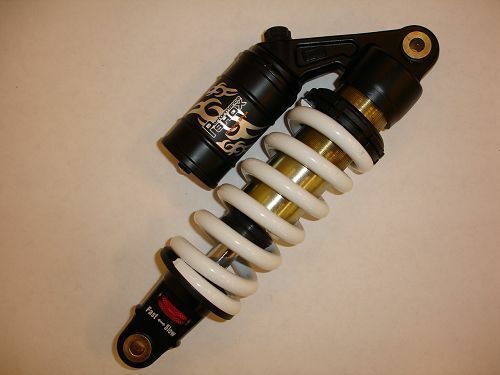 DNM HRC Professional Grade Race shock for Pit Bikes Features: Nitrogen charged oil dampened race shock. 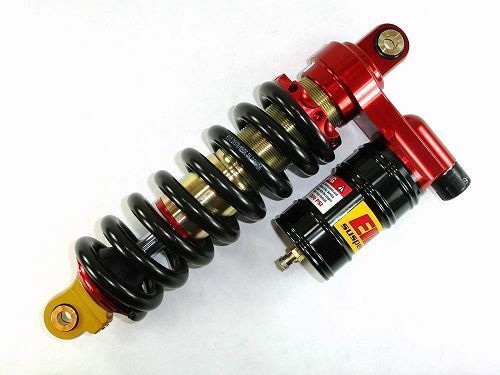 Compression adjustment Rebound adjustment 1000 pound per inch coil suitable for straight style swingarms 300mm length For: Most pit bikes with straight swingarm design. 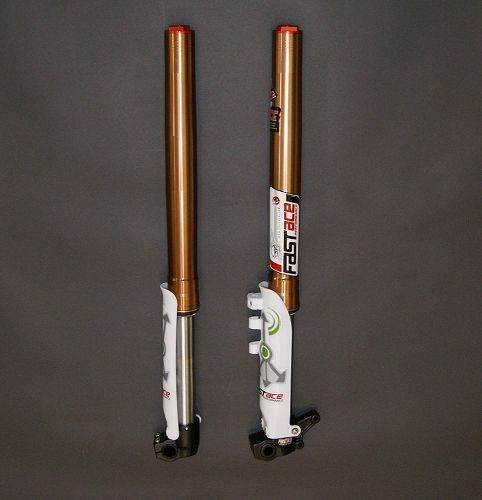 This is the same shock featured on the New 2009 Piranha P160-R Pit Bikes. 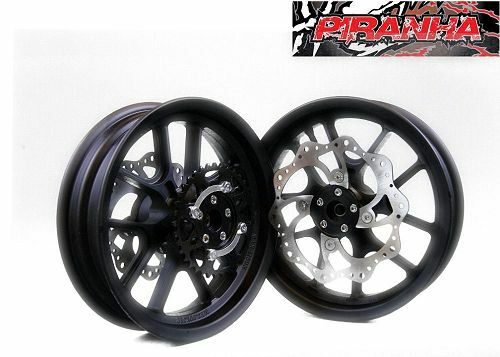 Piranha Pitbikes TM V2 Complete Motard Wheel Set Includes Everything shown in photos - Pre Assembled 12" Piranha Race Wheel 110/70 - 12 KENDA Motard Tires 12 X 2.15 Steel Rims with Polished Aluminum Hubs Brake Discs 39 Tooth Sprocket Accepts standard 15mm Axles For: Modified Honda CRF-50's, Thumpstar, SDG, BBR, SSR, Roketa, , Red Barron, Pitster Pro, Sikk MX, Xtreme, Piranha, Coolster, and almost all other Pit bikes. 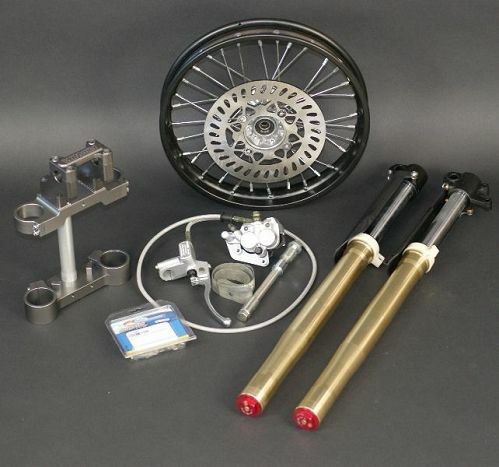 Complete front end kit for the Honda CRF70 and XR70. Front end kit includes 700mm Zhengling forks (same make as GPX/Pitster Pro) with compression and rebound adjustment, Black Billet CRF70 fork clamps with risers for 7/8 inch handlebars. 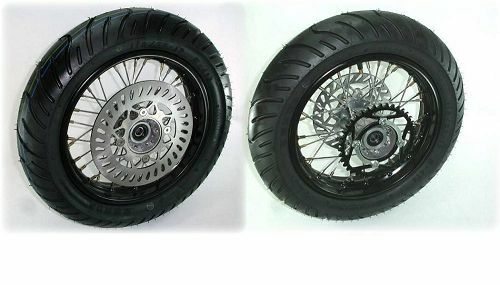 Steel 14" front wheel with billet hub, Dual piston front brake system. This system is completely designed for the Honda CRF70 XR70. Simply pull of your old front end, and bolt on your new inverted fully adjustable Front end kit! All mounting hardware included. Includes All Balls CRF70 steering stem bearings! Complete front end kit for the Honda CRF70 and XR70. 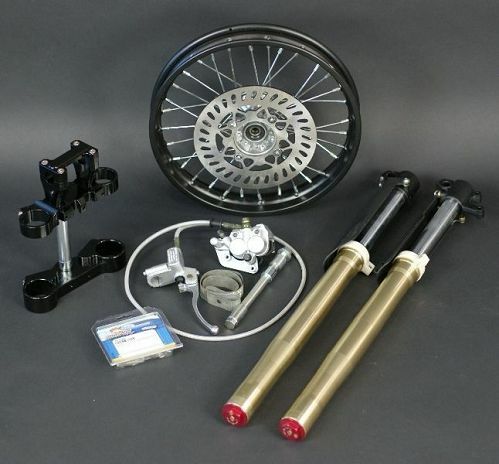 Front end kit includes 730mm FAST ACE AKX01RC forks with dual compression and rebound adjustments, Black Billet CRF70 fork clamps with risers for 7/8 inch handlebars. 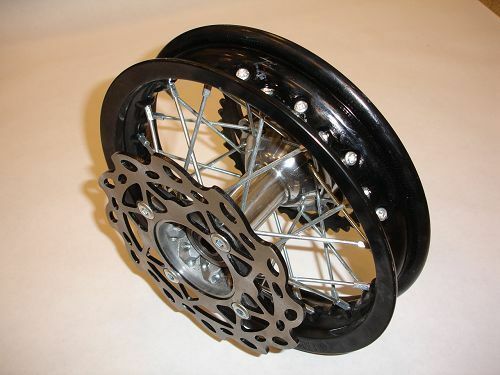 Piranha 7116 Aluminum 14" front wheel with billet hub, Dual piston front brake system. 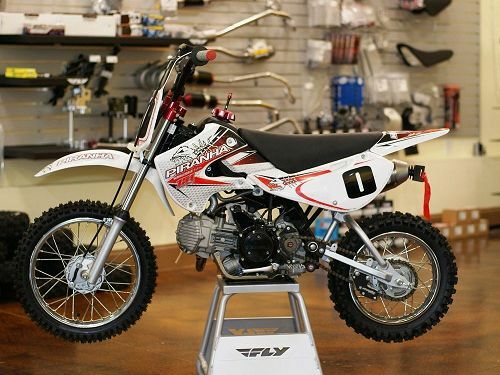 This system is completely designed for the Honda CRF70 XR70. Simply pull of your old front end, and bolt on your new inverted fully adjustable Front end kit! All mounting hardware included. Includes All Balls CRF70 steering stem bearings! Piranha Complete Front End V2. Why piece it together when Piranha has done all the work for you? 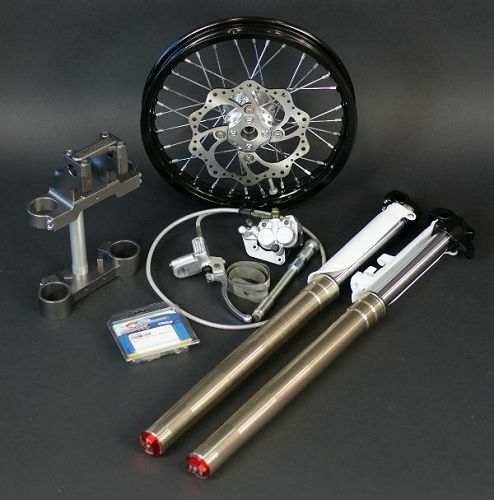 Simply take off your CRF50 forks and slide on a complete front end kit from Wholesale Cycle! Features: 600mm Inverted Forks, Billet Aluminum Black Triple Clamps / Risers, 12" Aluminum, 32 spoke Race wheel 1.60 wide, Hydraulic Brake System, Stainless Steel Brake Lines, Custom Steering tube (CRF50 and most pit bikes), And Everything else shown in picture! Now includes Tapered Stem bearings! Complete front end kit for the Honda CRF50 and XR50. 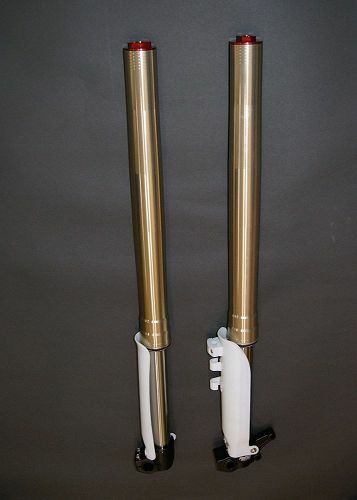 Front end kit includes 650mm FAST ACE AKX01RC copper color forks with dual compression and rebound adjustments, Piranha Adjustable Black Billet CRF50 fork clamps with risers for 7/8 inch handlebars. 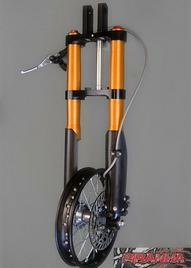 Piranha 7116 Aluminum 12" front wheel with billet hub, Dual piston front brake system, and Piranha G style disc. This system is completely designed for the Honda CRF50 XR50. Simply pull of your old front end, and bolt on your new inverted fully adjustable Front end kit! All mounting hardware included. Includes All Balls CRF50 steering stem bearings. Note, This system is designed to be used with a longer swigarm than stock. Forks can be dropped down in the clamps to achieve a proper height. Tested, Tuned, and Developed by Wholesale Cycle. The Kawasaki KLX110 /DRZ110 cheater kit. Build the ultimate sleeper. With this kit your bike will still look stock, even though its not! Kit includes a OEM Kawaski KLX110 cylinder (marked 111cc) bored out to 143cc, High compression piston, High performance camshaft for stock head, Performance matched Mikuni carburetor (works with stock airbox and stock throttle cable and carb cap), Flex Jet remote fuel screw, FMF Factory 4.1 Stainless exhaust system. MIKUNI VM260-606 CARBURETOR. WITH SIDE CHOKE. MADE IN JAPAN. 19mm Mikuni Carburetor. A perfect fit for 88cc kits and 90cc Pit bikes! MIKUNI 26mm / 22MM CARBURETOR Mikuni builds the best carburetors in the world. This Carb features a fast idle choke circuit. 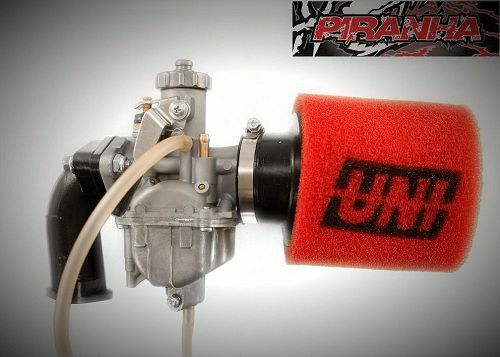 This Carb is a perfect upgrade for many 107cc to 140cc pit bikes. Carb measures 26mm at venturi and 22mm at slide. In asia, this is called a 26mm carb. In the USA we would use the English method and call it a 22mm carb. If this is all too technical, just remember its a great fit for 107cc to 140cc engines. And this carburetor is often found as stock equipment on 125cc and 140cc Pit Bikes. Includes port matched andled intake manifold (swings carb away from motor for more clearance), Intake insulator and gasket, Uni 1.5" 2-stage air filter. Please note prices are subject to change. Please contact us for availability and pricing as kits change monthly.